1. 90% of our sharks are taken within two miles from shore which makes them easily accessible to Ft. Lauderdale fishing boats. 2. We have an almost constant flow of fishable gulfstream influenced water. 3. Our outer reef line is only one mile offshore and holds an abundance of food opportunities for larger predatory fish (e.g. shark). 4. Many sharks take up temporary residence on our wrecks and reef lines. 5. Even more sharks migrate thru, swimming into the almost always present current, giving Ft. Lauderdale fishing boats the opportunity to choose an up current spot for interception of a traveling bad boy. Baits of choice are usually large and always fresh. Our favorite fresh dead baits for sharks are king mackerel, bonito, and grey tilefish fished with heavy wire leaders and triple strength razor sharp hooks. Our favorite live baits while fishing in Ft. Lauderdale, Miami and surrounding areas are large blue runners (jack family), rainbow runners and mullet (there is something about a big fat oily live mullet smell and movement that drives sharks wild). The following are some of our favorite species of sharks available when targeting sharks on your Ft. Lauderdale fishing charter. Hammerhead sharks are the most encountered species available for Ft. Lauderdale fishing. They are a favorite of Capt. Steve and myself. Easily distinguished by their wide flat and streamlined head these sharks have a deserved reputation as strong fighters. Typically five to seven feet in length, but grow much larger. The Hammerhead is an especially powerful fast moving shark that makes full use of an incredibly sensitive homing mechanism to locate a food source. Almost all Hammerhead sharks we encounter fishing in Fort Lauderdale advance up a scent trail very hot and readily baitable when they get a visual identification of their target. Steve and I both agree that Ft. Lauderdale fishing offers fewer more impressive sights than that of an adult Hammerhead shark literally ripping across the surface in a full throttle approach to a hapless frisky live bait suspended below a fishing kite. Just as he is about to strike we often reel the live bait up and just out of reach, and then give it back, and watch Ft. Lauderdale fishing’s bad boy get really hot and bothered. The baitfish is by now fully aware of its predicament, and the shark is also fully aware that the score is baitfish one and shark zero. The result is a front row seat to raw naked aggression with a predictable result. You can often hear the sharks sickle tail slicing the surface as it constantly tightens its “circle of death” on the frantic kite suspended baitfish. We also catch these sharks on the previously mentioned dead baits fished again from kites (for the visual opportunity to actually see this shark before the bite). Larger dead baits of virtually whole fish take large numbers of sharks when fished on the bottom or at “mid depth”. Fort Lauderdale fishing also offers a chance for a Thresher shark. These are open water or “deep-sea” sharks. Virtually all these sharks taken while fishing in Ft. Lauderdale are on bottom fished baits in 300 to 400 feet of water. We only occasionally get a bite on a mid-depth presentation and virtually never see one on our surface baits, or in our chum slicks. I do know of one taken on a kite fishing live bait. When it took the bait all aboard said it was a once in a fishing lifetime sight. These Atlantic Thresher sharks occasionally jump after being hooked. Pacific Ocean Threshers often “free jump”, looking as if they swam up and out, re-entering the water cleanly. We had a twelve footer do an airborne summersault at least 15 feet up last year. No clean entry here, but a giant splash. Typically a down and dirty fighter that often takes a lot of line off the reel in a short period of time. Sorry Fort Lauderdale fishing can’t really offer an aerial display if you hook a Thresher, but you will be in for a prolonged tug of war type fight that usually leads us to guess Thresher shark long before we first see him these sharks are now a protected species and may not be boated (Federal law). Ft. Lauderdale charter fishing boats release these fish alive. If you are looking to mount your fish, taxidermy is available as a “replica/release” mount (which is what most of our sailfish are). 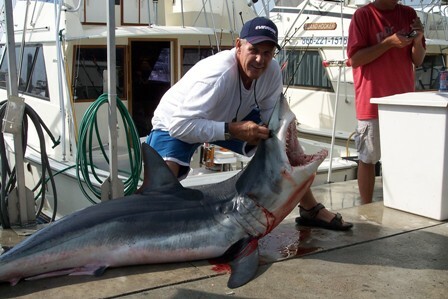 Mako sharks are a prized catch in Ft. Lauderdale fishing. They are never caught with any regularity, but are fairly often encountered when targeting sharks in general in 300 to 500 feet of water. Rarely seen inside 200 foot depths off southeast Florida. When caught in 300 to 500 feet of water most Makos are taken on a fresh dead bait fished directly on the bottom. Dead baits fished at mid-depth also account for a fair share, with surface presentations only occasionally getting hit. Mako sharks are also seen off-shore fishing in Fort Lauderdale on our deep sea swordfish grounds, typically when they take a shot at your hooked swordfish. Very few Fort Lauderdale charter boats specifically fish for them there due to the strong gulf stream current. We have caught them there combining boatside shark baits fished along with our typical swordfish spread. Heavy bodied, yet sleek with a very pointed snout. Deep rich neon blue in color with large dark eyes. Sinister long inward curving teeth and a large mouth. All this makes the Mako a very impressive shark, especially when he cruises in on his own accord to check out a boat side shark offering fished with him in mind, or maybe to investigate your struggling swordfish. Our Ft. Lauderdale fishing climate and blossoming night time swordfishery are right up Mr. Mako’s alley. 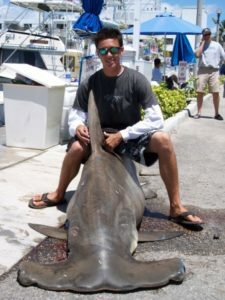 The Mako shark is one of the highest leaping and most dangerous game fish we encounter while fishing in Fort Lauderdale. A Mako can vertically out jump a marlin by a considerable margin. Not all Makos are jumpers, but violent and reckless somersaulting jumps by those that do make the Mako another one of our favorite sharks. Bull sharks, Caribbean Reef, Dusky, Black Tip and Spinner sharks are all available to you if you choose to go fishing in Fort Lauderdale. Bull sharks have a very notorious (and deserved) reputation. They are directly linked to many recent (and past) coastal Florida shark attacks, some of them fatal. Bull sharks are often encountered and sometimes specifically target by the Marlin My Darlin. We target Bull sharks when they take up residence on any of our many shipwrecks (typically from 60 to 300 feet of water). We know when they are “on” these Ft. Lauderdale fishing wrecks because virtually every snapper, grouper, amberjack or even barracuda (they love these) never make it to boat side before they are taken after being hooked by our charter party. Ready to pick a fight? The crew of Marlin My Darlin is always ready for this opportunity. Heavy tackle is a must because of the proximity of the shipwreck. He stays close to the wreck he has chosen, but will actually move to and from various wrecks in the vicinity. Intelligence and powerful sharks with a huge mouth and thick body similar to that of a Tiger shark. Typically very difficult to persuade him to come to the surface. Dusky sharks (we call them “swimming rocks”) Caribbean Reef and Black Tips spend a lot of time on top of and just offshore of our reefs. Spinner sharks are typically less than five feet in length. We see them from literally right on the beach (these are the fellows you see on the news “sharks swarm South Florida beaches” etc.) on out to several hundred feet. Sometimes Spinner sharks like to school up in large numbers. These are great sportfish, smallish, but exceptionally quick and very strong. Characterized by their spinning vertical leaps whether hooked up or not. A very smart and lets say “nasty” adversary. Lots of fun here. This is a short list of the many shark fishing opportunities available to our Ft. Lauderdale fishing charters. The Marlin My Darlin crew is ready and experienced. Want to slug it out with a bad boy? Let’s pick a fight.